Designed to create clean, efficient, and space-saving installations when used with S66 connecting blocks. Open-ended to enable installers to lay in cable before snapping a block into place. 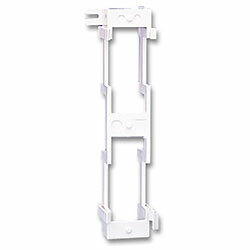 25-pair connectors and/or modular components can be mounted on the sides or back of the bracket. Molded from flame retardant thermoplastic.